If you love yoga positions like me and you have a memory like a sieve like I do, then these 50 yoga pretzel cards come to the rescue! 50 yoga pretzel cards show 50 different yoga positions for kids and grownups. Ideal for yourself and they can be used as a great way to spend quality time with your children. I mean: why should you wait until you are an adult having earned enough money to visit a spa resort or yoga retreat and only then say: eh, yoga is great for my body and soul? Well, if you are like me, then yoga is only something I started picking up because of the free sessions offered in the spa resorts I work in. Money was an issue and having free yoga instructors available surely made me sign up on the spot. But you can practice yoga for free! Some of these cards really tie you up in a knot, so make sure you do warming up exercises before doing any of the yoga positions shown. When using yoga cards you are basically your own yoga teacher learning yoga and meditation. The advantage of these cards is that you can practice yoga in the comfort of your house, not being bothered by having or not having the right yoga clothes or yoga equipment. These Yoga pretzel cards show yoga positions for beginners and more experienced. The cards are divided in 9 different categories to help you practice your stretching, bending, breathing and relaxing during your yoga training. Depending on the set you buy, the yoga pretzel cards include a Mr. Pretzel "bendo" toy with his own yoga mat. 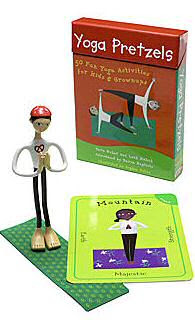 It's great to use this yoga doll in order to practice new yoga poses from the 50 cards. It beats bending the yoga toy the wrong way first in stead of straining muscles doing first time yoga stretches yourself the wrong way.